Every so often, I read a book that pulls me in so much that I obsess over it until I’m finished and then I still think about it for a long time and annoy all my friends by persistently recommending they read it until someone does. 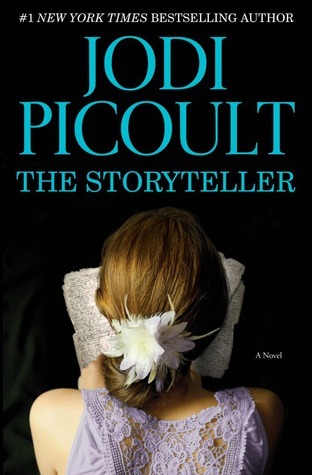 I have just had another experience like that with a book I read for a book club next month: The Storyteller by Jodi Picoult. Now, I think I’ve been pretty outspoken about how tired I am of historical fiction that deals with World War II. There’s just so much of it on the market. But this narrative was so emotional and personal that I was drawn in and blown away. Picoult introduces a pretty large cast of characters that have their own narration time, but it really works here. We have the main character Sage who is dealing with her own grief and insecurities in the modern day when she meets Josef, a gentle and kind old man who tells her that he was actually a Nazi fifty years ago. She then teams up with Leo, a Department of Justice Agent, to try to verify his story. We also get a lot of narration from Sage’s grandmother, a holocaust survivor. I don’t want to go into much detail about the plot because I don’t want to give anything away (there’s a signature Picoult plot twist, of course, to look forward to!) but the structure of the narration was intricate and balanced so that I felt the pace never dragged. I felt a connection with the main character Sage, and I appreciated that Picoult allowed her to, at times, be very flawed. She seemed like a realistic human being that I could understand and relate to. The information about the holocaust was devastating and emotionally powerful. A lot of books manufacture emotion by mentioning innately sad things (I’m looking at you, Nicholas Sparks), but this book really earned my emotion. It wasn’t trying to just make me sad because the holocaust was a topic – it really made me feel attached to the specific characters so that I cared what they were going through. Overall, I think that everyone should read this book. I think it will definitely appeal to people who like World War II history or general historical fiction, but it will also appeal to people who like domestic fiction that analyzes characters’ relationships.